I’ve been looking for ways to add more fish into our diet. The Stud Muffin has been requesting it, and it’s just not something that I happen to have a ton of ideas for. I have a few French recipes, but my husband isn’t going to want to watch me turn cute little trouts bright blue with vinegar (Truite au Bleu). If I make that dish, and put it in front of him he’s going to tell me “I don’t eat Smurf fish”… So- you can see my dilemma. You’ll be happy to know that this recipe won’t turn your fish blue, and it’s quite tasty. So is Truite au Bleu, but that’s another blog post for another time. This recipe is so fast to prepare, it would take you longer to get through a fast food drive-thru during the dinner rush. Not to mention this dish is much better for you. Speaking of meals that are better for you, let me quickly touch on some important facts about these 30-Minute Monday Meals. First, You, my fabulous readers have asked for more recipes that feature 80/20 Real Food. 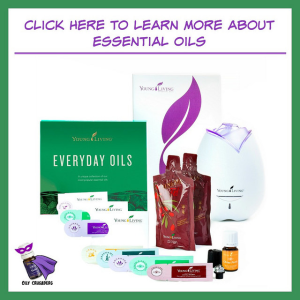 Many of you don’t eat 100% fully organic or 100% fully GMO-Free and you wanted recipes that were, well, more in line with how you guys really eat. I agreed to accommodate, so if you happen to be someone who would never eat 80/20, you have two choices. You can skip the ingredients that you wouldn’t be caught dead buying or eating and substitute them with something different, or, you can find something else on my blog that fits your personal food rules. Not every recipe I share on my blog will match everyone’s food philosophy 100% of the time. And that’s okay. That isn’t a good reason to stop following a blogger or leave nasty comments on a post. Instead, just make some changes to those recipes to suit your food philosophy or scroll past those that feature something that doesn’t jive with your views on Real Food. In my Real Food Community, we don’t do ‘Real Food Shaming’, and there is room for people on all points along the Real Food Path. 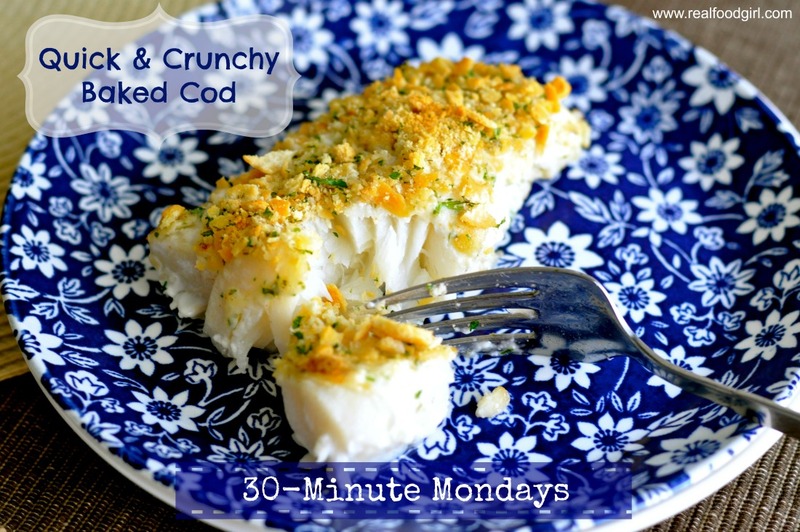 Alright, let’s get to the Crunchy Baked Cod. This dish calls for round butter crackers, such as Ritz ®. For our family, Ritz Crackers® wouldn’t be an option. I’d drizzle some butter over organic panko breadcrumbs seasoned with salt before I used Ritz®, so I used Annie’s Organic Classic Butter Crackers. If I’m going to use a boxed cracker in a recipe, my personal preference is to use something as organic as possible. If you can’t find Annie’s or a similar organic brand, another acceptable brand is Back to Nature. They would be my second choice. I used my homemade mayo in this recipe, and used fresh dill and parsley. If you don’t have fresh on hand, dried will do. Ha- there I go channeling my inner Ina Garten. This dish had a lot of flavor and the fish was tender and moist. Make sure you check for bones. I use a tweezers, but you can also use a needle nosed pliers. Here is a great step-by-step from The Kitchn that shows you how. 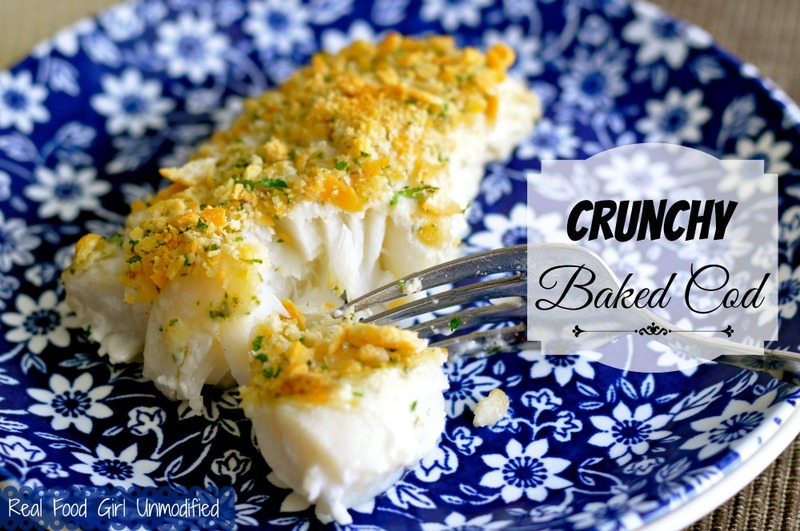 Crunchy Baked Cod comes together quickly so make sure you have the other components of your meal ready to go. This recipe is mild enough that it should be a real kid pleaser. What is your favorite kind of fish to prepare? Do your kids like fish? Heat the oven to 450 degrees and grease a glass or stone 9x13" baking dish with clarified butter. Pat the cod fillets dry and season with salt and pepper (I prefer white pepper on fish, but use it sparingly). Place the fillets in the baking dish. In a small bowl toss the cracker crumbs with HALF of the dill and HALF of the parsley. In another small bowl, combine the mayo, mustard, 1 tsp. of the lemon juice, the remaining dill and parsley and the cayenne. Mix well. Spread the mayo mixture on the top of each fillet. Press the crumb mixture into the mayonnaise, making sure they adhere. Bake until the crumbs are golden brown and all but the very center of fish has turned from translucent to opaque, about 15 minutes. Spritz each fillet with remaining lemon juice and serve with lemon wedges if desired. We had this fish with a nice salad made with a young spring mix and a cranberry pear vinaigrette. Pingback: 65+ Seafood Recipes - Oh, The Things We'll Make!